De Quervain’s Tendonitis (also known as ‘first dorsal compartment tendonitis’) is characterised by pain at the base of the thumb and the thumb side of the wrist. The pain is usually brought about by thumb and wrist movement especially grasping or holding an object and making a fist. The symptoms may progress gradually or acutely and may radiate down the thumb or up the forearm. The cause is irritation of tendons to the thumb as they pass across the wrist (the so called first dorsal extensor compartment of the wrist). Originally De Quervain tendinitis is treated non-surgically. These include resting the thumb and the wrist with a splint, activity modification, oral anti-inflammatory medication and Steroid injections around the tendons. These treatments help reduce the inflammation around the tendons and relieve the symptoms for a variable period of time. In severe or recurrent cases and cases not responsive to non-surgical treatment surgical release of the tendons is recommended. Hand Surgery is one of Dr Safvat’s interests and area of expertise. The principles of this operation are similar to a carpal tunnel release, but it is done at the wrist to release the tight fibrous tissue around the tendons and make more room for the tendons to glide. The procedure is done as a day only procedure without the need to stay overnight in hospital. 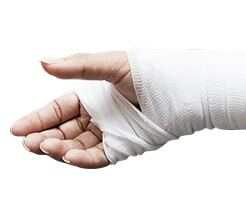 The hand and wrist is usually wrapped in a splint and bandages and patients are discharged with a sling to elevate their hands. The dressing needs to stay dry and intact for two weeks when Dr Safvat will remove them. Patients may need hand therapy after this and Dr Safvat will assess and organise this as needed.